Home / Free Recharge / Internet / Airtel ऑफर- 4GB Data और Unlimited Voice Calls पाए, सिर्फ Rs.345 में. Airtel ऑफर- 4GB Data और Unlimited Voice Calls पाए, सिर्फ Rs.345 में. Airtel 4G Handset best Offers की जानकारी; Free 4GB 4G/3G/2G Data + Unlimited Voice Calls ...अब आप पा सकते है 4GB 4G/3G/2G इन्टरनेट Data और Unlimited Voice Calls पाए सिर्फ 345 के रिचार्ज पर , Airtel 4G offer Free Data worth Rs 9000. How to get this awesome Internet Data & Unlimited Voice Calling offer. Airtel 4GB 4G/3G/2G Data & Unlimited Voice calls कैसे पाए. 1.sabse pehale airtel online recharge page par visit kare. 2. Plan list check kare. [plan range 345- 349, har circle (state) ke liye alag alag]. iske baad uss amount se recharge kare. 3. aapko unlimimited Local & STD voice calls milega. aur agar aap 4g handset user hai to 1GB data turant milega. 4. My Airtel app ko yehan se download karke aap 3 gb extra internet data claim kar sakte hai. 5. iss pack ki validity sirf 28 din hoga. 6. aap iss pack se 1 year me maximum 13 time recharge kar sakte hai. 7. ज्यादा जानकारी के लिए Airtel customer care से बात कर सकते है. 1.) 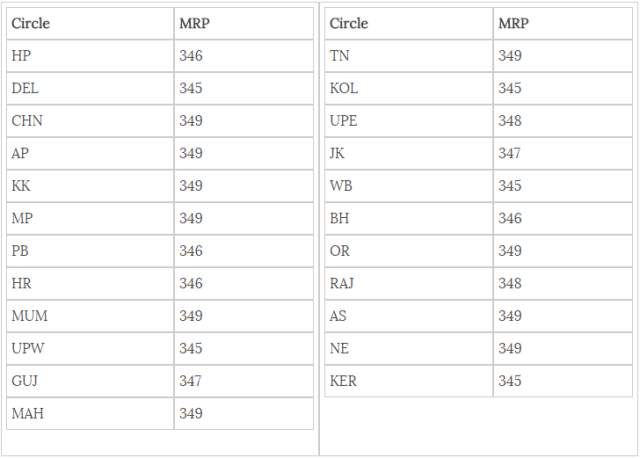 4G handset me upgrade karne ke baad, apna pehala airtel recharge Rs.345- 349 (depending on your circle) kare. isase aapko unlimited talk time aur 4 gb free data (1 gb turant + 3 gb airtel app par claim karne par) milega. 2) agale 12 recharge karne se aapko turant unlimited voice calls aur 4gb free airtel internet data mil jayega. jiska validit sirf 28 din hoga. 3.) aap iss pack se 1 year me [31 Dec, 2017 tak], maximum 13 times recharge kar sakte hai. Tags: airtel unlimited voice call offer, airtel free 2g/3g/4g internet offer tricks, airtel best & sasta plans & packs, free mobile recharge tricks, idea online recharge, idea prepaid recharge,idea mobile recharge, idea recharge plans, bsnl recharge, bsnl online recharge, free recharge tricks, docomo online recharge, free recharge coupons, reliance online recharge, rechargeitnow, freerecharge offer, bsnl offers, reliance recharge, airtel me free internet kaise use kare.